James Cook’s landing in Australia in 1770 changed the political, social and natural world. With regards to the latter, the animals the expedition discovered, described and exported have had profound effects on people’s experience and understanding of zoology. Whilst I believe that the descriptions of Cook’s party’s early encounters with kangaroos were ridiculous, it was these encounters that began Europe’s relationship with Australasian wildlife. A few marsupials in the Americas (opossums) were already known by this point, but a whole continent with entire ecosystems based around them, and including 6 foot kangaroos questions the very nature of mammals. What else could be left unknown? American opossums, with their pouches, would have been interesting discoveries among scientific communities, but they must have been nothing compared to the sensation of the kangaroo in the eyes of the public. On return to the UK, Joseph Banks (the legendary naturalist aboard Cook’s Endeavour) commissioned George Stubbs to paint the kangaroo and dingo on the basis of his descriptions and specimens and sketches by the crew. 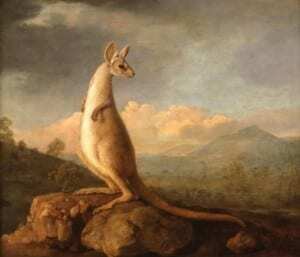 When considering the impact of the painting on the European psyche, it was Stubb’s kangaroo that became Europe’s first kangaroo (as argued by John Simons) – the archetype of kangarooness. It would come to be the key influence on representations of kangaroos for decades. The paintings are also emblematic of the age of exploration and the historical threshold of the European occupation of Australia. Nothing was ever the same again. Last year the two paintings were sold to an overseas buyer, but the government placed an export bar on them as it was felt that they are too important to our country’s heritage to leave. The National Maritime Museum (NMM) is currently raising funds to acquire them on behalf of the nation, something we at UCL Museums very much support. Indeed, we are partners in the programme of activities planned for the paintings once NMM have acquired them. My love of Australian mammals will bias me, but I personally can’t think of any artworks more important to the history of British exploration – not just in the way they introduced the animals to Europe but their positioning in time as emblems of discovery. That’s why I think it’s so important that the NMM campaign is successful. Full details of the Save Our Stubbs fundraising campaign are here. Please support it. NMM has already secured £3.2M from the Heritage Lottery Fund and £200,000 from the Art Fund which will go towards the acquisition of the works as well as conservation work and a public programme which will bring these remarkable works to the widest audience possible. It is this last part that the Grant Museum would be involved in. NMM contacted us as they were interested in our iPad-based QRator programme, which allows visitors to the Museum to engage in conversations about the role of science in society and how museums like ours should operate. QRator won last year’s Museums + Heritage Award for Innovation and has attracted a lot of interest from the museum sector. Through a project called Traveller’s Tails, NMM want to work with us and our partners at UCL Centre for Digital Humanities to explore what it means to participate through digital technologies in museums and how that can expand the social interpretation of objects. This project will build on the QRator research and look to find ways of enabling visitors to respond to provocative challenges, to debate and exchange ideas in front of the paintings themselves. 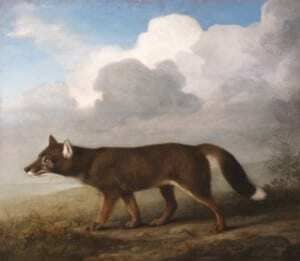 It will take place in galleries and online, linking the Stubbs paintings with wider collections across the country. A very exiting outcome of the project would be for the kangaroo painting to be exhibited here on loan in 2015, alongside the digital interactives. My plan would be to engage our history of science and art academics in a programme around the historic representation of animals, as well as natural history and exploration. Fortunately, I don’t have to wait until 2015 to see the painting as it, and the dingo, are on display at the National Maritime Museum until November 5th.